Who is ready to for the next step in our triathlon adventure, and do this Olympic size tri! I've signed up, come join! Plenty of time to train and get ready for this fun race! Besides signing up here, please don't forget to sign up for the actual race via the link provided above. While some of our other races are more competitive, Disco is without a doubt our most popular. It simple… Gold chains, big hair, polyester and silk, a KILLER race course, a beach start and a finish next to the lake. You won’t be alone at Disco. 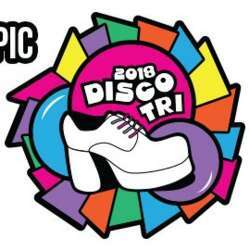 You’ll have a thousand fellow athletes joining you on the course, along with tons of spectators to cheer you on and join us on the dance floor to do that boogie thang! Afros welcome!